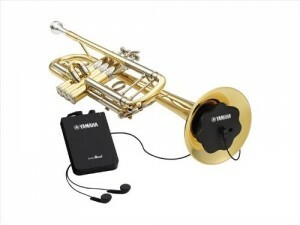 Brass instruments can be loud, but Yamaha devised a way for horn players to practice while listening to hi-fidelity sound that is only audible to the performer. The innovative, award-winning SB7X SILENT Brass systems provide musicians with the ultimate practice tool, ideal for use in any silent practice or warm-up situation. The popular SB7X SILENT Brass systems have evolved through innovative advances in sound technology and construction. The systems offer a more comfortable and realistic experience than ever before. The smaller, lightweight design of the new pickup mute offers outstanding sound reduction and provides a natural playing feel, stable pitch and overall retention of the basic playing characteristics. The mute features Brass Resonance Modeling trade a leading-edge technology that delivers superior and realistic brass instrument sound. Another system component, the compact Personal Studio trade; unit, includes a headphone jack and allows for easy attachment of an external audio player in order to practice with pre-recorded material. The SB7X SILENT Brass systems can also enhance recordings and provide live sound reinforcement. Combine this new technology with a high quality practice mute that has impeccable intonation and balanced resistance and you get a mobile practice studio perfect for home, backstage, hotel rooms and even airplanes.